Performed live on an electronic drumkit, Real Reggae are raw reggae performances ready for your reggae, dub or ska tracks formatted as both Songs & Grooves. Included are Timbale, Woodblock & Cowbell one-shot samples as WAV files as well as a stereo 16 velocity BFD2 Timbale instrument. This multi-format collection includes grooves formatted for BFD3®, BFD2®, BFD Eco®, EZDrummer®, Superior Drummer®, Addictive Drums®, Steven Slate Drums 4, Cakewalk® Session Drummer™ as well as General MIDI Standard MIDI Files which can be used with any GM compatible drum software or hardware --- this includes drum machines and synthesizers which have drum sounds. Platinum Samples and John Emrich are two of the foremost producers of drum samples in the world, with over 50 years of experience in the professional music industry, and now they have turned their attention to developing MIDI Grooves. 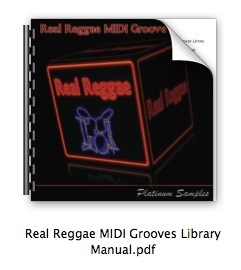 Real Reggae was recorded by John Emrich on a Yamaha DTX900 electronic drum set. Optimized for 1 Kick, 1 Snare, 3 Toms, 1 Hihat, 2 Crash cymbals, 1 Ride cymbal, 1 Cowbell, 1 Woodblock and a Low & High Timbale. The Superior Drummer preset included uses the Percussion EZX available from Toontrack.